Special thanks to Christoph Braun from the FH St. Pölten, who is the resident 3D printing expert and prepared the steps to produce the amazing results! 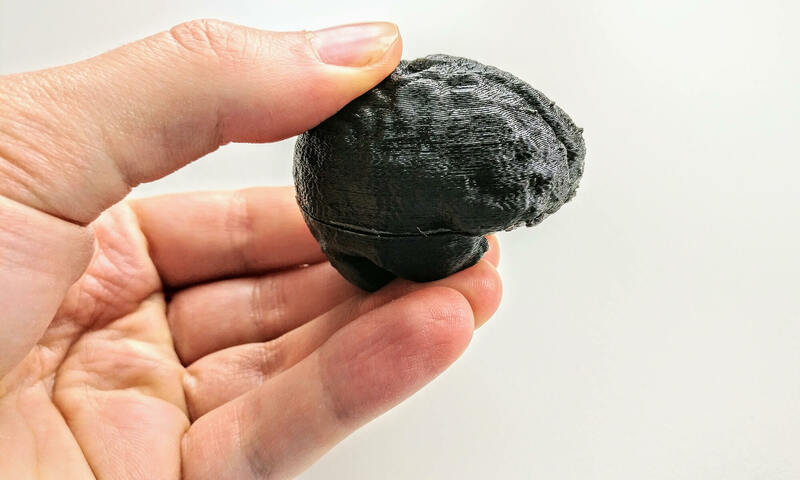 Traditional plastic-based 3D printers can’t easily print overhang – they need to place support structures or use support material. 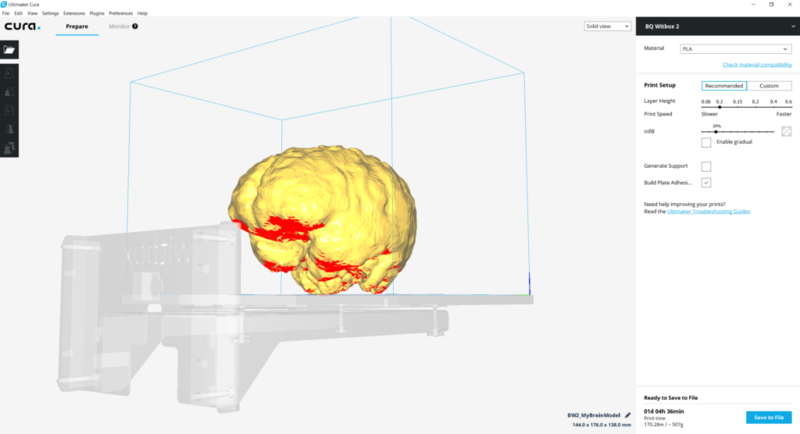 However, typical structures segmented from MRT, CT or ultrasound images don’t have flat surfaces – as such, you can’t directly send the files to a printer like you could with a box, without considering the contents first. 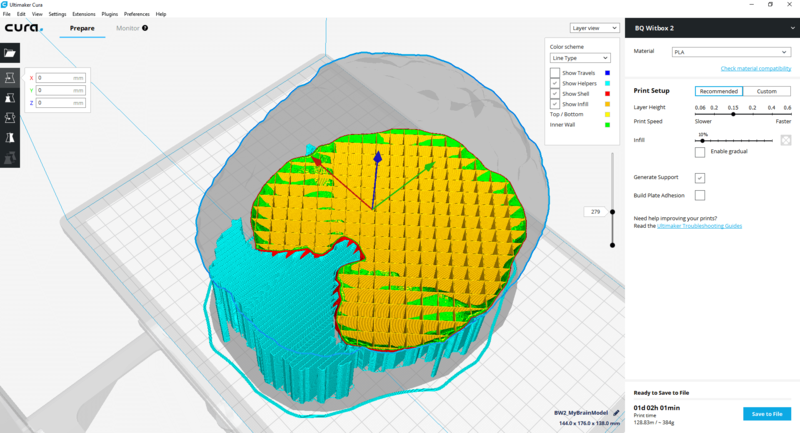 Therefore, the 3D printing software adds supporting structures to ensure the overhang has a base to stand on. After printing, this needs to be cut away and the surface sanded. If the object has fine details, these of course get lost during the manual and mechanic removal of support material. At the University of Applied Sciences in St. Pölten, we tested the 3D printing using the Witbox 2 from BQ. As recommended by BQ, we used Cura for slicing. The support / helper material is shown in turquoise, the checkered infill in orange. On the upper half seen in the photo, the support structures have been removed. However, with the fine details from an MRT scan, you’d also need to apply sanding to get a cleaner surface; and this would remove a lot of the details. As such, the traditional support structures are problematic when printing medical data. 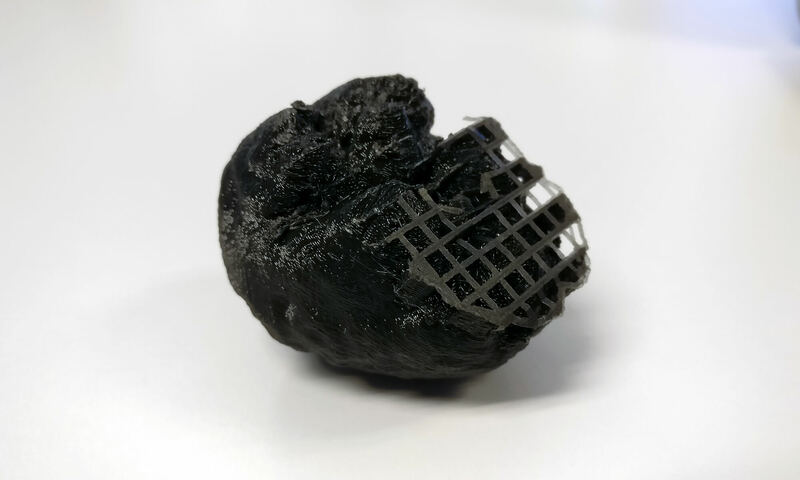 Of course, more advanced printers offer other ways to remove the support material – e.g., when the supporting structures are based on a gel, or a different material that can be dissolved in water or chemicals, or a different process called sintering that “hardens” the usable material out of powder. Michael Armbruster has written a good overview. Unfortunately, these technologies make the printer more expensive, and they also add to the cost of the 3D printed object. Therefore, we’ll look at other ways to reduce the need for support materials to a minimum in the next part.